Great times don't last forever. The banking industry, once the king of good times, knows this only too well. Banks had decades of comfort with minimal customer churn, low competition, great 'personal trust', minimal regulations, zero pressure to change etc. The high pedestal came crashing down with the flood of fin-tech startups that redefined convenience and instant gratification with innovative, technology driven processes and offerings. Add well informed, spoilt for choice customers to the mix and we have a traditional banking model struggling for growth and often, survival. shoes cannot compensate for poor financial health and customer relationships. Digital is a marathon journey, not a short burst sprint towards customer's hearts and wallets. To be completely fit to take on growth challenges, a bank should be healthy both on the outside, by offering a delightful customer experience and inside, by the delivering the said experience with an agile unified platform. segmentation can give valuable intelligence to relationship managers. This allows teams to offer relevant financial offerings that customers actually need at the right time, thus boosting conversion. Intelligent and automated journeys that can be build and edited quickly in real time enables faster go to market for innovative and regulatory compliant financial products. 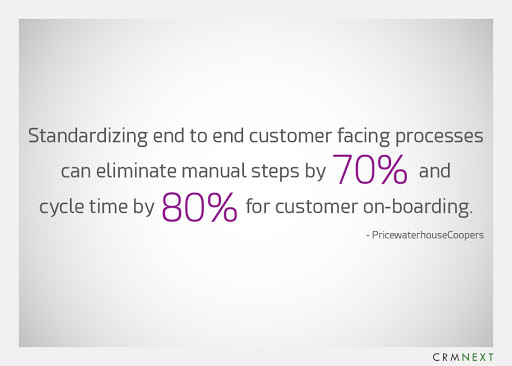 Engaging effectively with customers allows you to take full advantage of life-cycle value in one platform. Today, a banking CRM enables fast and friction-less integration with credit verification bureaus, core systems, in-depth account activity intelligence, smart digital document collection, to offer pre-approved offerings with automated decision journeys that result in instant gratification. Intelligent segmentation powers predictive analysis and generates AI-powered sales signals. This enables teams and relationship managers (RMs) to proactively take advantage of every cross-sell or upsell opportunity. It also opens new revenue channels in the form of automated next best product support processes, smart chat-bot driven personalized financial advice, portfolio management, third-party advertising, and paid value added services. CRM for banking allows users to offer fair product pricing along with complete peer comparability. Such transparent processes will deepen customer trust, hitherto sorely lacking, in the banking and financial services industry. Silos are bottlenecks for fast turnarounds. Destroying them by implementing CRM for banking will create a lean organization that is as quick to adapt as digital fintech firms. Local banks can move to shared-services or utility models to maximize scale and reduce costs along with integrating, aligning process-centric IT operations capabilities. Adding automated integration and connector capability into the delivery model can reduce costs and boost new product development. It is one thing to rely on legacy systems to survive in today's digital age. It is another to use it to climb up the digital value chain in intense competition. Digitization is not merely a marriage of convenience by converting manual spreadsheet processes into automated digital ones. It also means making internal processes more efficient and change ready through code-less architecture. A Middle Eastern bank consolidated regional data centers into global shared services, used code-less visual designers to create service journeys and saved approximately 65% of their operational costs. The ability to weave a single customer journey across departments will open up new revenue models. Faster go to market through better front-end customer interactions and straight through processing delivers enormous benefits to business and customers. Cutting complex and lengthy processes for a quick and simple KYC is one instance of streamlined governance. Seamless integrations with credit rating and social agencies makes it easy to deliver instant fulfillment. Streamlined governance will establish and reinforce clear accountability, decision rights, and stakeholder roles. It will also define goals and incentives that are clearly aligned with strategic imperatives and force stakeholders to adhere to a metrics-driven culture with key performance indicators (KPIs), unit cost management, etc. The NEXT generation operating model can empower your bank to upgrade customer experience, intelligently streamline processes and cut costs in your operations. It will align your operation’s performance goals to your business priorities and enhance its most distinctive operations capabilities and meet your transformation objectives.